Dr. Sanjiv Narayan of the University of California, San Diego gave a presentation entitled “Cellular Remodeling and Spatial Mapping of Human AF.” Dr. Narayan is known for inventing the FIRM mapping/ablation system (Topera). (For a discussion of the FIRM system, see BAFS 2013: FIRM [Focal Impulse and Rotor Modulation] for Catheter Ablation of A-Fib by Dr. Narayan of UC San Diego). Whereas what Dr. Narayan described as Spatially Localized (”Drivers”) are identifiable A-Fib targets. 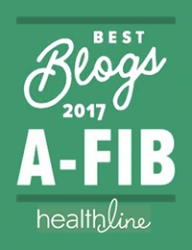 When one ablates these “(true) sources,” A-Fib is eliminated. But A-Fib remodeling often leads to ‘substrates’ (CFAEs) that are spatially localized. Dr. Narayan discussed the role of PACs (Premature Atrial Contractions) in A-Fib remodeling (‘Substrate’, CFAEs). In describing the findings from his own studies of fibrosis and Stiles’ “Reduced Voltage areas”2, PACs trigger A-Fib. 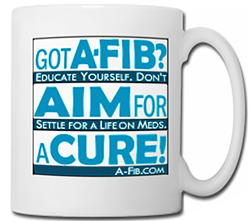 But they don’t in patients without A-Fib. Advanced or cellular remodeling may be due to APD (Action Potential Duration) Oscillations at slow rates in a rotor pattern, and they enable PACs to trigger A-Fib. In mapping these signals, A-Fib is sustained by spatially reproducible rotors. 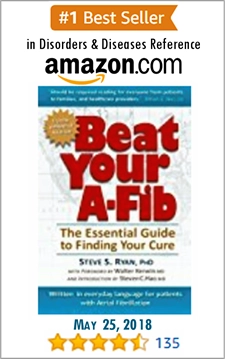 • Remodeling is the “rosetta stone” linking basic science with clinical observations of A-Fib. • Remodeling is spatially non-uniform and regional, that explains clinical observations, A-Fib ‘substrates’. We still don’t understand how the FIRM system algorithms actually work. We can only speculate that the FIRM mapping system identifies Sustaining Mechanisms (Substrate, CFAEs) that produce rotors and filters out others that don’t. However, unless someone “leaks” the algorithms, we’ll probably never know and be able to compare and evaluate the FIRM system. Dr. Narayan’s findings about PACs (Premature Atrial Contractions) is most important for A-Fib patients. Doctors tend to dismiss PACs because everyone gets them. But as many people with A-Fib know all too well, PACs often precede an A-Fib attack. Dr. Narayan’s studies show that PACs trigger A-Fib attacks, but they don’t in people without A-Fib. And PACs can be very disturbing, even if they don’t trigger A-Fib, particularly in people who’ve had a successful catheter ablation and are A-Fib free. Many EPs map and ablate CAFEs (Sustained Mechanisms, Substrates) when trying to “cure” patients in Persistent A-Fib. But according to Dr. Narayan, ablating these areas is ineffective “Localized ablation can’t work,” because there is no discrete target as there is for areas producing rotors. (The ECGI system also seems to identify foci and rotors as compared to CFAEs.) For patients, Dr. Narayan’s observations may result in much less unnecessary burning and scarring of the heart during an ablation procedure. But here’s a possible way the FIRM system could possibly be evaluated. Take a standard Lasso mapping catheter or a system like ECGI and meticulously identify every possible A-Fib producing spot in, for example, an animal or human heart in long-term persistent A-Fib. Such a heart usually has many different A-Fib producing spots. Carefully mark the exact location of every foci, rotor, potential, CFAE or any spot producing possible A-Fib signals. Then immediately afterwards, use the FIRM mapping system on the same heart and compare the results. The FIRM system usually finds only one or two A-Fib signal sources in each atria. 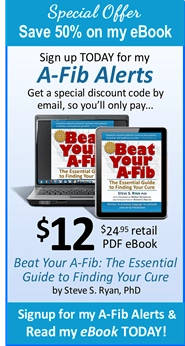 The FIRM algorithm probably filters out a lot of other A-Fib signal sources as noise. What does the FIRM system filter out? 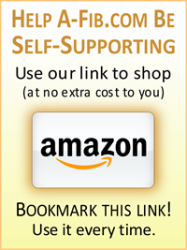 What does it select? 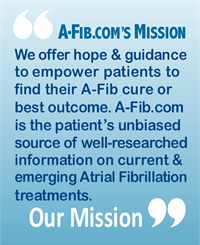 In the live satellite case presented at the 2014 Boston A-Fib Symposium in Orlando, the Bordeaux group using the ECGI system found many different foci and rotors in a patient in persistent A-Fib. But these were clustered in predominantly three areas. Would they show up in the FIRM system as only three foci/rotors?